What do you do if you’re a cop who’s been suspended, your family will have nothing to do with you, the press hound you and treat you as a villain, and it’s almost Christmas and you’re thinking of eating a bullet? Become a mall Santa, of course. Police officer Nick Pappas is currently suspended following an on-the-job shooting incident. While sitting around his home, wallowing in pity, Nick gets a call from a former partner who is now working security at a local mall in the San Diego area. The mall is regularly being hit by a series of robberies, targeting shoppers. Nick is convinced to help out, but realizes only too late that his under-cover role is playing Santa Claus. A jolly old elf adored by children is not a role that comes even close to natural for Nick. Nick’s handler is the head elf who won’t let Nick back out of performing his role and is of the personality type that always sees the brightest side of any issue. Will Nick’s biggest challenge be catching the criminals, keeping his Santa suit clean, or dealing with a perpetually perky elf? Author Alan Russell has done a really nice job of giving us three-dimensional characters that we care about. Even the grumpy, irascible Nick Pappas (perhaps especially Nick Pappas) is someone we develop a soft spot for. And the story grows a variety of sub-plots that Russell weaves together quite well. As dark as the story starts, with Nick giving thoughts to ending it all, it grows brighter as one might expect, or at least hope a Christmas story would. However, it is well-tempered with a dose of reality that will almost certainly bring a tear or a lump in the reader’s throat. There are a few moments when the writing moves from ‘showing’ to ‘telling’ but over-all we get caught up in the story and the characters and it’s a smooth read. Although written with a Christmas setting, this isn’t just a Christmas novel. It is a mystery with characters who grow. What more can you want in a book? Looking for a good book? 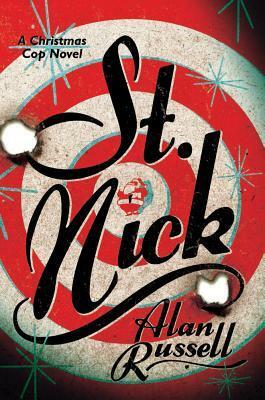 St. Nick, by Alan Russell, is a moving, engaging mystery with strong, like-able characters, good for any season. I received an electronic copy of this book from the publisher, through Netgalley, in exchange for an honest review.